WSNA members are in the forefront of the campaign against illegal hotels in residential buildings. And while we expect a great deal of action this fall (including City Council legislation to support), it’s worth remembering that WSNA has been working on this issue for more than a year, and we’ve made a lot of progress. We’re finally savvy enough with the computer to post news coverage from our February rally…please see below for WSNA’s TV moment of fame, when close to 100 WSNA members braved the cold on a Sunday afternoon to raid an illegal hotel lobby and demand the building’s return to real residential use. WSNA is working with local elected officials and the City government to identify and crack down on illegal hotels. If apartments in your building are being used illegally as hotel rooms, or if you’d like to get involved in the fight to preserve affordable housing, please contact John Raskin at Housing Conservation Coordinators at 212-716-1665 and make sure you click here to become a WSNA member! 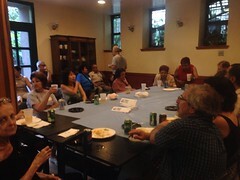 « 1st Annual WSNA Potluck Party a Success!